Q1 What can I earn as a freelance proofreader or copy-editor? The recommended minimum rates for freelance proofreaders (not mandatory) for publishing companies are £25 an hour, and £29.10 for freelance copy-editors (SfEP, March 2018); on specialist books up to £40 an hour can be achieved. Freelancers have few expenses and work from home. They only need a telephone, internet access and a place to work quietly. You may earn more working freelance as a proofreader or copy-editor for non-publishers such as local businesses or companies. Q2 Are there any hidden charges for Chapterhouse proofreading courses? No. Unlike some providers of proofreading and copy-editing courses, we don’t charge you extra for postage and packing, for any of your assessments provided as part of the course, or for your certificate. Q3 How do I go about getting work as a freelance proofreader? We show the best way to market and promote yourself and how to make the best of your particular skills, and many of our certificated students have enjoyed excellent careers since taking the course. Whether you want to work for publishers or for a wide variety of other organisations we show you how to succeed – and we’ll even help you to write your CV. Q4 Do a lot of people work freelance as proofreaders/copy-editors? Freelancers have always been an important part of the book industry and more books have been published in the UK in recent years than ever before, producing ever more work for freelancers. Many former students have been successful in establishing careers working for non-publishing clients. Any company or organisation which produces brochures, pamphlets, documents, reports or booklets is likely to need your services. Q5 How computer literate do I need to be? Freelance editors and proofreaders work either on paper or on screen, depending partly on the work in hand. Even when work is sent to a freelancer as an attachment, many people still find their error spotting is of a higher level if they print off the material and check it on hard copy! 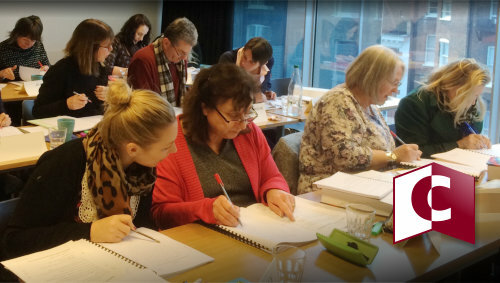 If you prefer to work in the traditional way on paper, our courses provide full training. If you are studying copy-editing with us, we offer an optional free module covering copy-editing on screen using Microsoft Word. Q6 Can I do the course and find work abroad? Yes, and many of our students do. Indeed, living abroad may even give you an advantage. It is possible to work for UK publishers from abroad, but you may do better to work for local businesses publishing in a mixture of the local language and English; the quantity of material published in the corporate and publishing sectors in English is huge. Former Chapterhouse students living overseas have, for example, established good businesses working as editors and proofreaders for local companies on materials aimed at the tourist industry or at second-home owners. Q7 Is the system in the USA the same as in the UK? Obviously there are some spelling differences between the UK and the USA, but these are easily learned, and it is simple for a proofreader or copy-editor to adapt between the two countries. Our courses are based on British English spellings and usage (e.g. “colour” and “autumn” rather than “color” and “fall”) but the same principles and methods of working apply in the UK as in the USA. Q8 Do I have to live near publishers to get work? No. Most freelancers working for publishers work by email or through the postal system or courier services, and it doesn’t matter where you live. Clients usually pay your despatch cost if you’re posting back corrected hard copy. Q9 Will the course help me to get a full-time job in publishing? Yes. Look at our sample comments from ex-students! We can’t guarantee success, but the course is well respected and doing it shows application and seriousness. Q10 How long do the proofreading and copy-editing courses take? You can finish the Proofreader Plus distance learning course in as little as six weeks, and the Proofreading and Copy-editing Skills course in just ten weeks, but enrolment for either course lasts for twelve months if you want to work at a more leisurely pace! The seminars are the fastest way to learn, in just a single day or four days. Q11 What sort of feedback will I get? On the proofreading and copy-editing correspondence courses, your tutor will mark your assessments in detail, show where you have slipped up and where you’ve done well. The assessments are returned to you with a form which highlights your strengths and weaknesses and indicates what you need to work on next, and we send you a model answer for the exercise, with full notes explaining any points which students might find difficult. Students are recommended to work on the points which their tutor has commented on before tackling the next assessment. If you need help you can email for full personal advice from a tutor. Q12 Is the certificate valuable? Yes. All the Chapterhouse courses, whether by correspondence or by attending a seminar, are certified on completion. The Chapterhouse courses are well respected in the UK and internationally, and to achieve a certificate of competence on any of our courses is significant evidence of your ability. We mark assessments in our proofreading and copy-editing courses to a similar standard to that used by publishers in their own assessments. Q13 Can I get help after the course? Yes. For two years after you complete the course there is a free email advice service available. We want you to succeed, whether you want to work as a proofreader or as an editor, or both, and will help in any way we can with technicalities, marketing or establishing your business. We’ll even check your CV and offer suggestions on ways to improve your chances of getting work. Q14 Can I get my money back? For the first fourteen days you can, as long as your course is unmarked and in unused condition when you return it; that gives you plenty of time to inspect the course thoroughly. 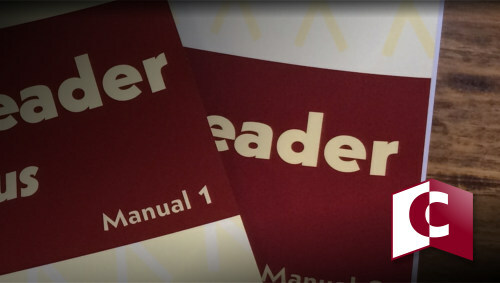 Once we’ve received the course materials back at the Chapterhouse office, a refund is made within fourteen days (in accordance with the Consumer Contract Regulations). Cancellations for seminars can only be accepted twenty-one days or more before the course start date, and are subject to a £45 administration charge. Course dates can also be transferred up to twenty-one days before start of course for a fee of £25. Q15 How much do the courses cost? 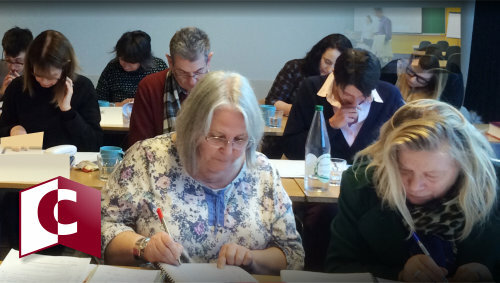 Proofreading and Editorial Skills course – view prices. Proofreader Plus – view prices. 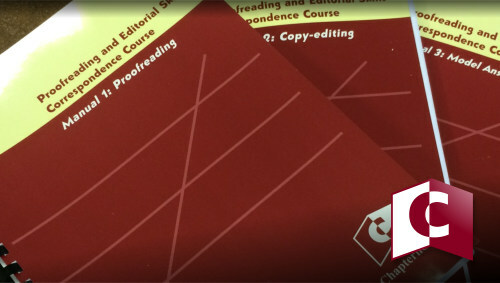 Copy-editing and Proofreading Seminar – view prices. Proofreader Express Seminar – view prices. Q16 How are the distance learning courses despatched? By second class post. If you pay online by PayPal (or by card over the phone) your course will be posted to you within five working days. Payments by cheque or by standing order are posted out when we have been notified by our bank that your payment has been cleared. Q17 Can I pay the special offer price by instalments? The discounted prices for Chapterhouse proofreading and copy-editing courses only apply to payments made in full on booking (either online, by card over the phone or by cheque).